Race Capture – Designed and built Autosport Labs’ Race Capture website. Used Bootstrap, Ruby on Rails and YUI. EatMetrics – Rearchitected EatMetric’s session tracking and reporting system. Original system took 10-20 seconds to display chart data and calculate visits. Frequent timeouts and out of memory errors. New architecture with proper database schema, nightly report generation, optimized queries and indexes resulted in page load times under one second. Also improved security through SSL, SSL and HTTP only cookies. Firefox Personas – Core developer for Firefox’s Personas website. Prepared the site for integration with Firefox 3.6, which involved extensive performance optimizations. Managed product direction and website development after Firefox 3.6 launch. Mozilla Add-ons – Developer for add-ons website in early 2008 and 2009. Recommended performance improvements and mentored intern who executed on those recommendations. Mozilla.com – Recommended and implemented performance improvements for Mozilla.com, reducing overall page load time and increasing conversions. Mozilla Community Store – Built Mozilla’s Community Store website from the ground up with another developer at Mozilla. Met with marketing team to discuss requirements and schedule. Yahoo! 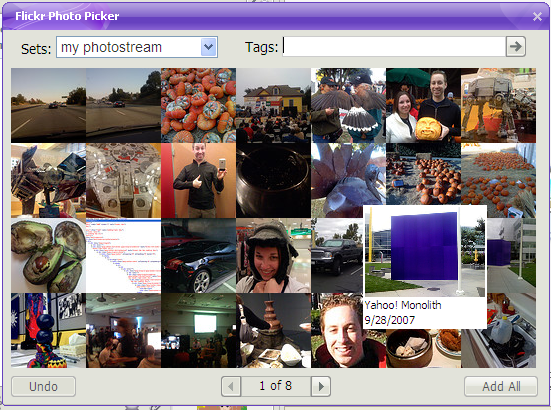 Messenger/Flickr Integration – Worked with a client engineer to create an in-client Flickr photo picker. I was responsible for the UI, written in HTML, JS & CSS which communicated with the client via a JS/C++ interface. Picker utilizes extensive XHR & DHTML to provide a seamless user experience. I also wrote the authentication backend in PHP, which communicated with multiple servers to fetch and store Flickr account information. Yahoo! Messenger Blog – Built Yahoo! Messenger’s blog from the ground up using WordPress and design comps. Clean, semantic markup all done by yours truly. Yahoo! Messenger Website Primary developer for Yahoo! Messenger’s website. Continually improved code and performance of site. Also responsible for localization engineering for 19 different locales/languages. Pages/areas I’ve worked on: Vista client promotion, Accessories page and Beta promotion.